Yes! 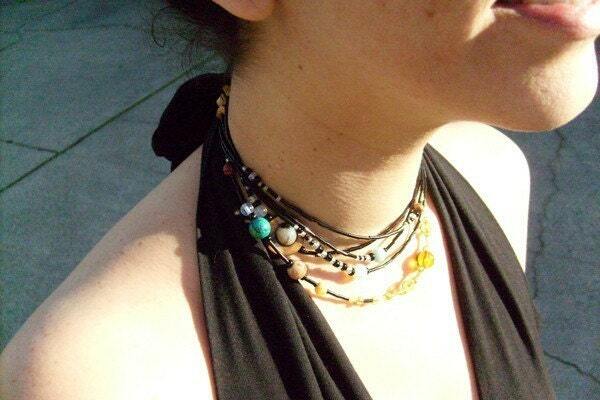 The Original Proportional Solar System Necklace featured by The Planetary Society! Beautiful Natural Gemstones and tiny glass beads demonstrate each planet's distance from the Sun. Distances are proportionally accurate, with each bead representing approximately 20 million miles of Space. Includes an informational card with a Diagram of the Solar System, including the measurements used, and the gemstones that represent each planet. 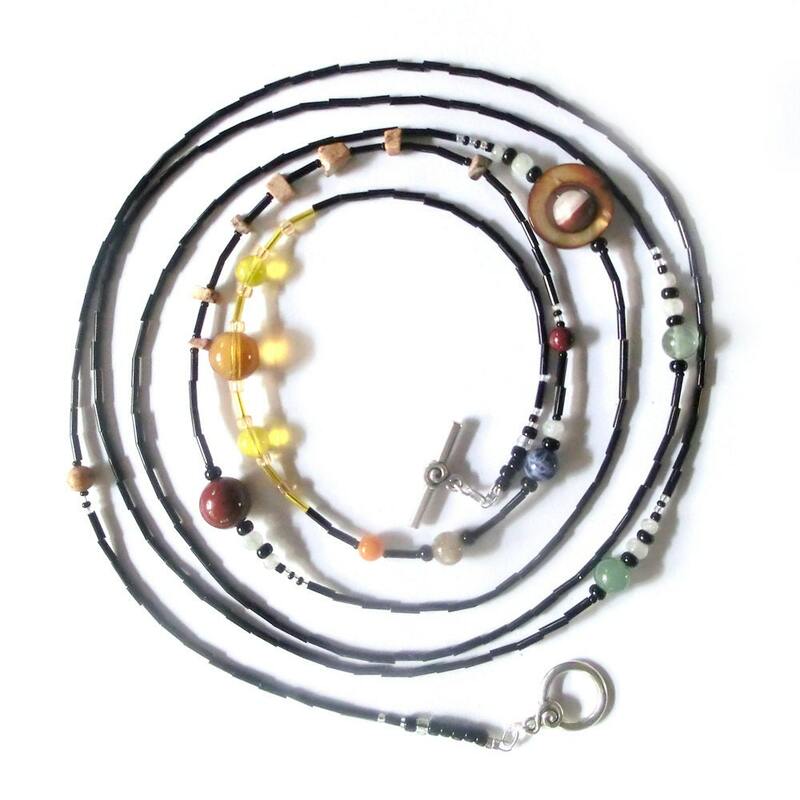 Our original Solar System Necklace includes the Sun, Mercury, Venus, Earth & our Moon, Mars, the Asteroid Belt (includes 7 Asteroids to represent Ceres, Vesta, or your favorites), Jupiter, Saturn, Uranus, Neptune, and the popular controversial dwarf planet Pluto, representing the Kuiper belt. Planets with many moons are accented with opalescent glass beads. Planets, moons, and asteroids are enlarged for dramatic emphasis*. inspiring celestial thoughts of the vastness of Space. Based on a pattern from Nature. 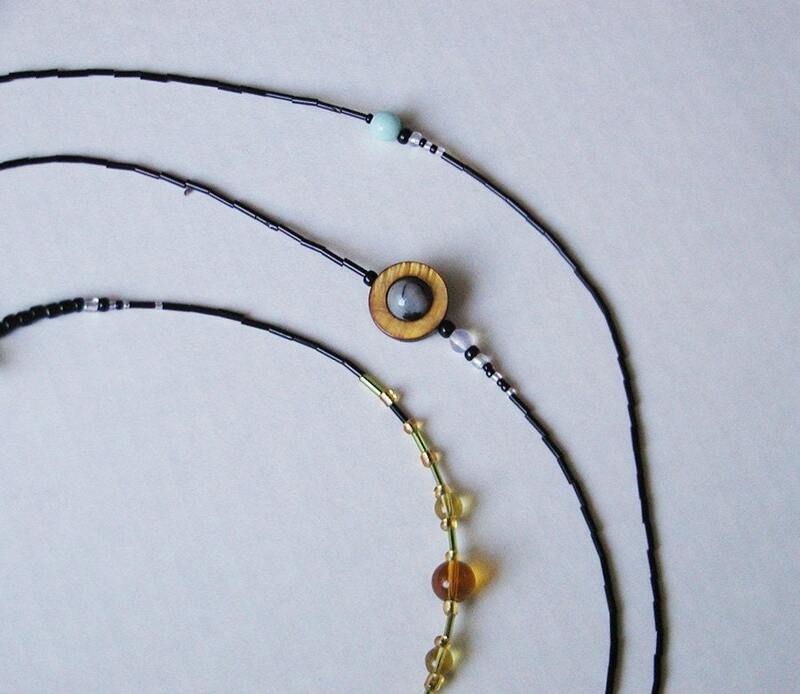 Read more about the Solar System Necklace Series! Imitation is flattery, they say! However, please beware of counterfeits! 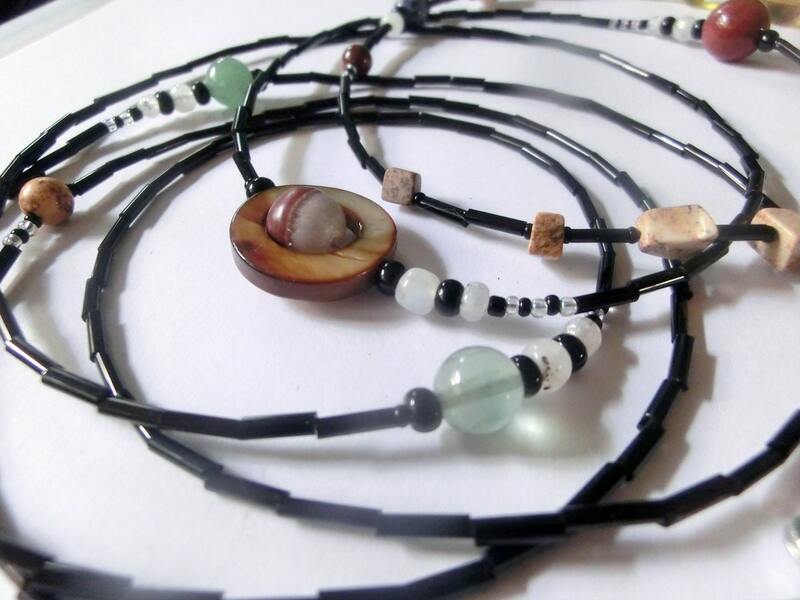 Since NASA made a tutorial based on our MiniVerse Necklace in 2010, we have seen shops creating copies of our work, using cheap, low-quality materials. Some even try to copy the names of our pieces. We have also seen re-sellers, selling our items for very high prices, usually around the holiday season. We are not affiliated with these sellers or their products, and can't make any guarantees about them. Please ask about custom designs, custom lengths, or custom clasps. We can make any size bracelet, to fit anyone! if you need a specialized length or clasp for any item. and most items can be made with a lobster-claw or toggle clasp. Please note that custom orders may take up to an additional 1-2 weeks. your item will be considered a custom item and will take up to an additional 2 weeks to complete. We use durable, high-quality Jeweler's-grade beads and wire. We test everything, and our jewelry should last a long time under normal fashion jewelry wear conditions. We recommend removing your jewelry before bathing, swimming, sports, or any activity that will place unusual stress on your jewelry. These items are not designed to go in the washing machine, dryer, microwave, or dishwasher. These items are not designed to be load-bearing (please do not hang anything from them or tie them around something). We can often give a discount if you are buying 3 or more of the same item. Please send a conversation through Etsy if you are looking for a wedding set, a group costume, or a small number of items for a special occasion. please send a message via Etsy if you are interested in Wholesale orders. Each item includes a small folding card with a description of the item and space to write. Most items are shipped in a small cardboard jewelry box, stamped with our logo. Please send us a note if you would like to include a gift message with your order! We use high-quality Natural Gemstones. Please expect variations in Gemstone texture and color. We prioritize quality and color rather than needing to find a specific gem. Occasional variations in stones, clasps & findings may occur, based on trends and availability. please let us know and we'll do our best to get it there on time. We thank you in advance for your patience! or high volumes of orders due to good reviews and holidays. we will do our best to contact you as soon as we can. This necklace is even cooler in person. 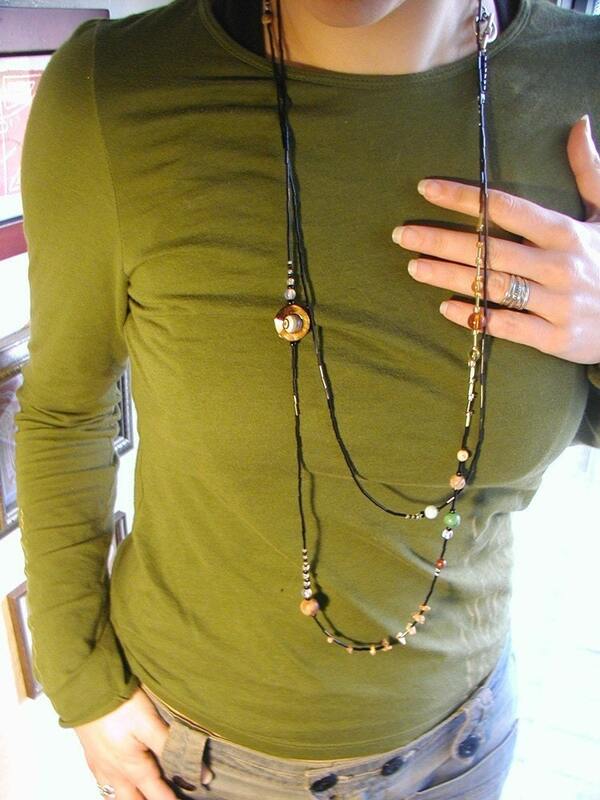 Just a wonderful innovative inspiring necklace and my new favorite piece- thank you!